The Bush administration is taking major steps to boost confidence in the U.S. beef supply at home and abroad, where more than 30 countries have banned American beef products since mad cow disease first surfaced in Washington state a week ago. In so doing, the administration enacted regulations that Congress blocked only months ago. The changes announced Tuesday include a ban on meat from cows that can't walk or stand on their own and a promise to speed creation of a nationwide animal tracking system. Agriculture Secretary Ann Veneman said consumers shouldn't see an increase in prices as a result. A spokesman for the meatpacking industry, however, said beef prices could increase "pennies per pound." The projected cost for the tracking system that would allow rapid response to a disease outbreak is more than $500 million for the first six years. The regulations are supported by consumer and animal welfare advocates and include faster testing of cattle at higher risk of mad cow disease because of age or the presence of neurological problems. Meat will not be processed until test results are back. 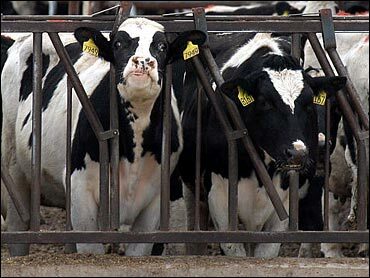 Some 190,000 sick or injured cattle are slaughtered each year. Currently, only about one in 20 are tested for serious diseases, according to the Washington Post. Veneman said small intestines from cows will no longer be allowed into the U.S. food supply, nor head and spinal tissue from cattle older than 30 months — an age chosen because the disease generally has an incubation period of at least three years, officials said. In addition, the Bush administration is ordering changes in slaughterhouse techniques to prevent meat from being accidentally contaminated with brain or spinal cord tissue that can spread bovine spongiform encephalopathy (BSE), or mad cow disease. "Sound science continues to be our guide," Veneman said, adding that the food supply was safe even before she announced tougher regulations. Mad cow disease is a concern because humans who eat brain or spinal matter from an infected cow can develop a brain-wasting illness, variant Creutzfeldt-Jakob disease. During a mad cow outbreak in the 1980s in Britain, 143 people died of it. The first U.S. case of mad cow disease was found in a Washington state Holstein slaughtered Dec. 9. The Food and Drug Administration said for now it will not prohibit the use of the high-risk cattle products in pet foods and feed for chickens and pigs, saying there is no scientific evidence to support such a ban. There has been a ban on using cattle products in feed for cattle, sheep and goats since August 1997. Many of the changes were implemented by Canada in May, when a single case of mad cow surfaced in Alberta. USDA had been considering some of the measures before the Washington state case. A coalition of congressional Republicans and farm state Democrats had blocked Congress from including the ban on meat from downed animals in a $373 billion catchall spending bill that has passed the House and awaits a vote in the Senate. Democratic presidential candidates have seized on the mad cow emergency to criticize the Bush administration for policies they said have left the nation more vulnerable to such problems. Several Democratic lawmakers said they would push for a statutory ban on downed animals, notwithstanding the new regulation announced by Veneman. Dan Murphy, spokesman for the American Meat Institute, the meatpackers' trade association, said his group generally supported the announced changes, although he called them "aggressive and extraordinary compared to international standards." Terry Stokes, chief executive officer of the National Cattlemen's Beef Association, said his group also agreed with USDA's actions. "As USDA reiterated, the beef supply is safe, and these steps taken today are being done out of an abundance of caution," he said. But there are questions about how well current regulations are enforced. Since 1997, the U.S. has banned cattle feed containing cattle remains, in order to prevent an outbreak of mad cow disease. In 2000 and 2002, according to The Washington Post, the General Accounting Office found problems in compliance with the ban. Last spring, the USDA's own survey found that 35 percent of the ground beef produced by an "Advanced Meat Recovery System" contained "unacceptable nervous tissues," reports CBS News Correspondent Lee Cowan. Under the new U.S. regulations, the sick cow slaughtered in Washington state earlier this month would not have been allowed to enter the food chain. The cow was sent to meatpacking plants almost two weeks before test results showed that it had mad cow disease. The meat from that cow was allowed to be sold for human consumption after its brain and spinal column were removed and a federal inspector saw no indication of neurological disease. Saying it was a just a precaution, USDA ordered a recall of more than 10,000 pounds of meat from 20 cows slaughtered with the Holstein on Dec. 9. The recalled meat was distributed to eight states and Guam, although officials said 80 percent of it went to Oregon and Washington. Dr. Ron DeHaven, USDA's chief veterinarian, said authorities have determined that some of the cows already in quarantine in Washington are among the 81 Canadian-born cows from the same herd as the sick Holstein that records indicate entered the United States in late 2001. The search continues for cattle that might have eaten contaminated feed that is the most likely source of infection. The government of Cuba said it will postpone its planned purchases of 500 American cattle, because of concerns over mad cow disease. Beef prices extended their steep decline Tuesday on the Chicago Mercantile Exchange, with key contracts falling the exchange-allowed limit for a fourth consecutive session after early buying interest fizzled.